Stapleford has two new Parish Councillors. However there will be no parish elections in May as there were only 9 candidates for the 11 vacancies on the council. The Parish Council is looking for as new Clerk. Great Shelford library has launched its own loyalty card. You can now manage your GP appointments and prescriptions online from home for the Great Shelford surgery as well as having access to your test results. Police have issued advice to car owners after a Range Rover was stolen in Stapleford in what is believed to be a relay attack. A Stapleford charity will benefit from a classical concert in April. Volunteers are needed to help run Arthur's Shed at the Arthur Rank Hospice. Fancy joining a local bowls club? Could you help Stapleford if there was an emergency in the village? A new pilates class started in Stapleford in February. The Arthur Rank Hospice Christmas tree recycling initiative, which took place on Jan 11 and 12 collected more than 1800 trees, raising over £26,500. Three houses in Stapleford, Cambridge has been burgled in the last month. You can now ring the Great Shelford Medical Practice for free on their new number. The private purchase of the Tree pub by the Tree campaign group is being mediated by the District Council. A Community Warden scheme is being considered for Stapleford. But more people are needed to make the scheme viable. A new 20 MPH zone is being introduced in parts of Stapleford. See a map of the Stapleford roads affected. The Tree pub has been saved from demolition. (External link). The planning application to replace it with two homes and a new pub in Stapleford near Cambridge has been rejected. An appeal by the owner to reverse the decision by South Cambridgeshire Council has been dismissed. South Cambridgeshire Council is now pursuing a Compulsory Purchase Order. The Your Hospice Lottery for the Arthur Rank hospice may soon have helped raise £1 million for the charity. A house in London Road, Stapleford was broken into on May 25. The revised 7A bus service route and timetable started on July 30th with changes in Stapleford. The Liberal Democrats won the two District Council seats in the elections on May 3. The Gog Farmshop at Shelford Bottom has been crowned East Anglia’s Farm Shop & Deli award winner for 2018, and received a commendation for the nationwide Farm Shop of the Year. The future of the Rose and the Three Horseshoes was among the actions and decisions at the March Parish Council meeting. South Cambridgeshire MP Heidi Allen met with campaigners trying to save the Tree pub. During the meeting she heard about their campaign to turn the former pub into a community asset. Stapleford's school became an academy in 2018. Stapleford, Cambridge now has its own history website. A 29 acre development in Stapleford and Great Shelford, with 180 new homes and a "care village", is being offered online by an Essex developer. A scientist from Stapleford, Cambridge has been made a Companion of Honour, alongside J K Rowling and Sir Paul McCartney, “for services to science and society" in the Queen's birthday honours. Stapleford park's play area is the subject of a new video. Read more about the Stapleford Park facilities here. A fourth local estate agents is about to start selling houses in Stapleford, Cambridge. Redmayne Arnold Harris is opening in Woollards Lane, Great Shelford in summer 2017. The Stapleford park in Stapleford Cambridge is on Haverhill Road in Stapleford, Cambridgeshire. It includes a football/ cricket pitch, a playground, the Stapleford tennis club and the Jubilee Pavilion. Sunnyside pre-school playgroup in Stapleford near Cambridge has closed. Have you visited our sister websites? Stapleford is 4 miles from Cambridge. Around 1900 people now live in the village which lies between Great Shelford and Sawston. The village has a Community Primary School, a church hall, the Johnson Hall, St Andrew’s Church, the Jubilee Pavilion and two Public Houses, The Three Horseshoes, and The Rose. There is also a campaign to re-open The Tree pub. The pavilion, on the Stapleford Park or recreation ground, was renovated in 2012 and re-named the Jubilee Pavilion to mark the diamond jubilee of HM Queen Elizabeth II. Stapleford is twinned with Villedomer in the Loire Valley, France. Wandlebury, with the remains of a 5th Century BC Iron Age Hill Fort,110 acres of woods and chalk grassland, and 8 miles of footpaths, is in the north-east corner of Stapleford. The Magog Down is an area for restoration, conservation and informal recreation on the Gog Magog Hills off the A1307 road to Linton and on Haverhill Road, Stapleford. Famous people from Stapleford Cambridge include Sir John Sulston, Robert Huff and Thomas Blossom. Stapleford Parish Council is committed to maintaining the privacy and confidentiality of information relating to visitors to its website. By accessing the Parish Council website you consent to the processing by the Parish Council and its agents of any personal information given by you. Such processing may occur for any of the following reasons: i) keeping our records up to date; ii) learning more about you in order to develop, improve and manage the services we can offer you; iii) keeping you informed of any Parish Council activities or services by post, fax, email and telephone; iv) protecting both your and the Parish Council's interests. Users of this website do so at their own discretion and provide any such personal details requested at their own risk. Your personal information is kept private and stored securely until a time it is no longer required or has no use, as detailed in the Data Protection Act 1998. If you do not wish to be kept informed by Stapleford Parish Council of information that we think might be of interest to you please let us know by contacting us. 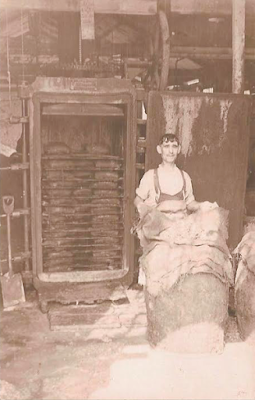 The Gelatine factory - one of more than 30 historical postcards and photos of old Stapleford featured on Stapleford Online. "We would very much like to thank the Stapleford community for being so wonderful over the many years we have delivered the post as we have left to start new adventures in Cornwall. " An old photo of Stapleford School was recently for sale on Ebay. Stapleford resident Shaun Levitt shared provided this photo of aircraft over Stapleford in 1944 to the Stapleford History website. The planes are B-17 Flying Fortress bombers. Below you can see Stapleford as it was before the housing development of the 1950s and 60s. You can also see the tank trap running diagonally across Haverhill Road and up towards Hinton Way. Stapleford photographer Keith Taylor exhibited his work (featured above) as part of the Cambridge Open Studios in July. A lovely photo of London Road, Stapleford sold for £23.50 on Ebay . 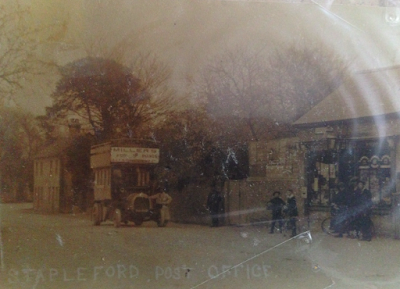 You can see other old photos and postcards of Stapleford, Cambridge here. This is an old postcard of Church Street Stapleford- see other old photos of Stapleford, Cambridge. Photo by Gerald Maguire - read more about the Stapleford Parish Pit here. The Stapleford Online website includes lots of old postcards and photos of Stapleford near Cambridge in yesteryear. Rev Simon Taylor became the Associate Parish Priest at St Andrews in Stapleford Cambridge in 2015. He wrote a blog setting out how he is addressing some of the challenges. Considerable efforts are made to ensure the accuracy of all information and adverts shown on the www.staplefordonline.com website. All information is believed to be correct at the time of publishing. However no responsibility or liability whatsoever can be accepted from any consequence of acting on advice or instructions given or inferred. All information on the website is subject to change at any time without notice. Any logos or trademarks displayed on the website are the rights and property of their respective owners. All information on the website and text is copyright of www.staplefordonline.com and any reproduction of this without express permission is strictly prohibited. David Martin is the editor in chief and writer of the Stapleford village website at www.staplefordonline.com. He was a NCTJ trained journalist before becoming the Managing Editor of BBC Radio Cambridgeshire and the creator of BBC Cambridgeshire Online. Streets covered by Stapleford Online include; Anvil Close, Aylesford Way, Babraham Road, Bar Close, Bar Lane, Bury Road, Cambridge Road, Chalk Hill, Cherry Tree Avenue, Church Street, Collier Way, Cox's Close, Dolphin Way, Dukes Meadow, Finch's Close, Forge End, Gog Magog Way, Greenfield Close, Greenhedges, Haverhill Road, Hawthorne Road, Heffer Close, Hinton Way, Joscelynes, London Road, Mingle Lane, Poplar Way, Priam's Way, St Andrew's Close, Sternes Way and Vine Close.